In G2 Crowd’s analysis of Business Intelligence reviews, we found that user satisfaction fell neatly along company size and deployment lines. 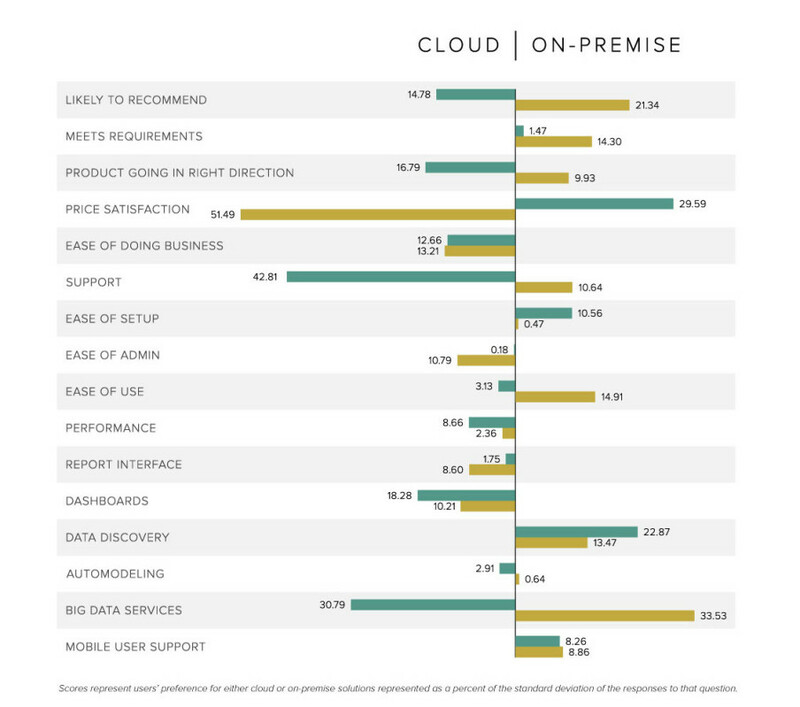 Despite the cost users associated with each, mid-market organizations prefer cloud BI products while enterprise companies are better served by on-premise solutions. The voice of the crowd offers a rare insight into the growth and position of the business intelligence software market. The played-out argument between cloud and on-premise software often ends with the same conclusion: There are advantages to both. Obviously, the cloud hasn’t choked on-premise providers out of the market, because they both outperform the other in some fields and both suffer from limitations. Many business intelligence software companies are investing deeply in both on-premise and cloud solutions, and new partnerships between traditional vendors and SaaS providers are formed often. Since businesses have easy access to either possibility, the logical next question is usually the one left unanswered. Which organizations benefit most from deploying in the cloud and which are best served by on-premise products? The tension between cloud and on-premise is especially pertinent to business intelligence platforms, because these applications are tied so directly to an organization’s IT infrastructure. The location of your datacenter and the control you have over its structure can matter a great deal to the quality and speed of insights extracted from data, and the resources required to maintain a datacenter in house is a substantial and at-times unjustifiable investment. Because many BI vendors offer both deployments for their solutions (including the vendors linked above), G2 Crowd set out to determine if industry or market segment affected how satisfied BI users are. We found significant differences in the success of enterprise and mid-market users between the type of deployment. Reviewers that worked for enterprise companies that had deployed on-premise solutions are more satisfied with their BI products. They said on-premise products better meet their requirements, and they are more likely to recommend them to their peers. Enterprise users also believe on-premise products are headed in the right direction for their organization’s needs more so than cloud solutions. Mid-market users felt the opposite. They recommend cloud solutions more commonly and prefer the roadmaps of cloud products. Both cloud and on-premise meet their requirements equally well, however, unlike enterprise users. Far and away, mid-market users also thought cloud vendors provide better customer support. This preference comes despite a wide disparity in product prices according to users (the largest disparity in the data between the two segments). Midmarket users found on-premise solutions to be substantially more cost effective, while those at enterprise companies preferred cloud products’ price tags. For BI, perhaps, you get what you pay for, because organizations that purchased the more expensive option rated it better in reviews. That difference in price did not translate to much of a difference in the number of user licenses organizations purchased, though. Enterprise and mid-market users’ opinions seldom aligned except for a few notable fields. Both find cloud BI providers to be easier to work with, and cloud dashboards are more attractive and useful, reviewers said. On the other hand, on-premise products provide better resources for data discovery and, perhaps surprisingly, mobile BI. We found another disparity when we asked about the breadth and quality of a product’s big data services. Of course, as BI solutions optimize for larger and larger organizations and companies contend with ever growing amounts of data, a product’s scalability becomes one its most important characteristics. It’d be easy to assume that the main difference for bigger companies is they have bigger big data, but as this IBM report explains, big data is important to both enterprise and mid-level and their requirements may differ beyond the number of bytes being processed. To date, cloud BI products have tackled the mid-market’s big data needs, while on-premise has more successfully wrestled with the enterprise’s scale and demands. Check out the charts above for more information about how BI users view their tools, hosted or not, and then see G2’s Business Intelligence Grid℠ to see how users rate individual products. Do you use a cloud tool or have BI installed on premise? 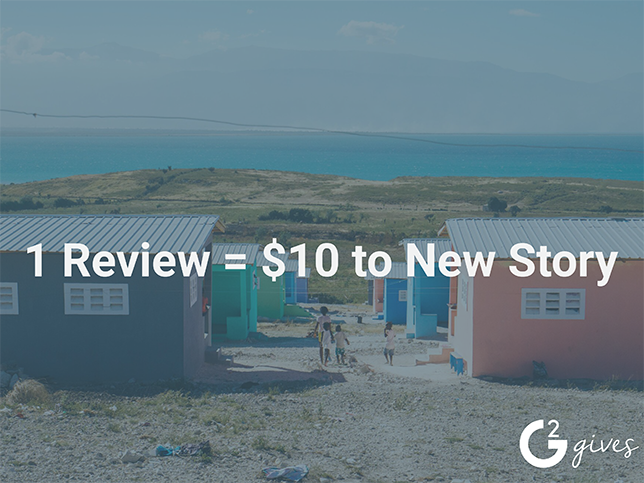 Provide a review of the product you use to help with our ongoing research. **In G2 Crowd’s 700 business intelligence surveys, 300 users and administrators included details about their deployment. 106 responders were enterprise employees while 114 reviewers worked for mid-market companies.